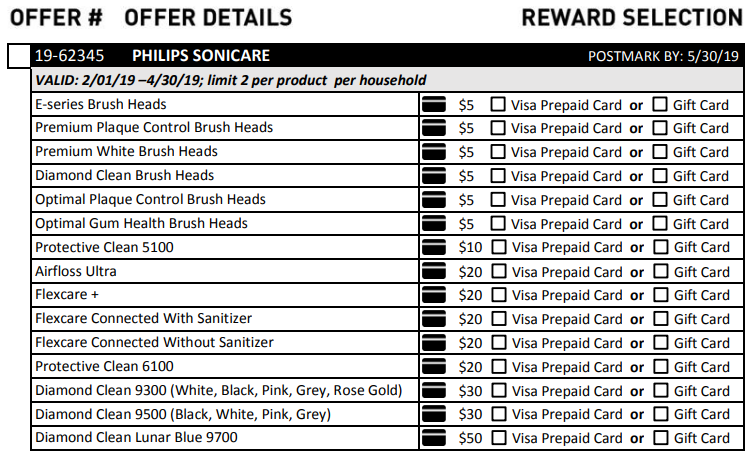 I had some time today to search for new coupons for the Sonicare electric toothbrush and because I only found a few this month I’m also going to mention some rebates I found. Hopefully you’ll be able to use at least one or two of these deals to save you some money. I checked Amazon for any new coupons and could only find one this week. 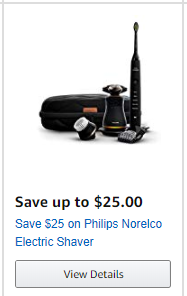 This coupon will save you $25 off when you purchase a Philips Sonicare Toothbrush and Norelco shaver kit. Next I headed over to the Bargain Bin Betty Coupon Database and did a quick search for “Sonicare” it turned up a single coupon that will save you $5 off a pack of multi brush heads. This is available as a printable coupon follow the link in the database. I also found a rebate for March that can save you some money. The one I found was this Bed Bath & Beyond Rebate Form that will save you up to $50 off your purchase. You can use this rebate to get a prepaid visa gift card. Your purchase must be made before April 30th and you must postmark it by May 30th 2019. You can print the rebate off using the above link. That’s all the savings I could find so far for March, I’ll keep looking but in the meantime if you find other coupons or deals please share them with us Via our Facebook page so that I can add them to the list. This entry was posted in Philips Sonicare Coupons, Uncategorized and tagged 2019, March, soniacare. ← My List of Sonicare coupons and rebates for January!